Our current Ordo Legionis also mentions Fort Greenwall, Fort Kastav and Fort Mistwatch. obviously contradicts the current location map. We should either fix former or latter. Neugrad shouldn't be just a legion fort but a town aswell, as it uses a colovian town name. Should be like Pelagiad. What are your thoughts about adding Dunstad to the southern Haafinheim? It would be good, if Falkirstad wasn't the only 'stad', we have. I don't know, if we couldn't just take one of the two villages for it. If Northhall is to keep its current name, it should be turned into an imperial or colovian town, otherwise we should nordify it like Granite Hall. Edit: I have mixed feelings about Blackmoor. Maybe add a branch of the Hjaalmarch between Eldersblood peak and Labyrinthian and have Blackmoor around there? It could be another imperial mining site. As far as I'm aware ~32,000 is the maximum the vanilla engine can handle. Well. Afaik during our timeframe Red Mountain stands to be bigger. Although it will certainly be smaller than Snow Throat in game units, but we don't care. I think we should give 32K a go with Snow Throat, and see how far we can push it. Yeah, Snow Throat should be ludicrously huge, as high as the engine will possibly allow. That Red Mountain is supposedly higher than High Hrothgar is an old misconception still perpetrated by the Imperial Geographical Guild. There is still the bigger red mountain mod that eviates our problem altogeher. The border mountains are already taller than rm now, which certainly conflicts with lore. The spacial-compression effects of the Tribunal's Ghostfence not only contain the dangerous denizens of Dagoth Ur, but also warp height-based geophysics, making the peak look shorter than it actually is. I wouldn't worry about the height of Red Mountain in relation to any of our mountains. If the border mountains are taller already, we just need to work in relation to those, for those with infinitely long MGE setups. - Added the location of Kogmenthist Castle ruins at a location mostly true to "steep hills to the south and north of the castle, and east of it lies swamp"
Good modifications. Good find with Kogmenthist Castle. Ice and Chitin mentions a number of sites, which should have existed in the second era somewhere along the northern shore of Skyrim. - Gorvigh Ridge. A mountain range along the northern coast whose cliffs directly lead into the water. - Nerone. A frozen Isthmus across the bay from Gorvigh Ridge. - A ruined keep built on Nerone by the Reman Empire, not known by name. - Porhnak. A settlement or a fortress where apparently some soldiers of the early septim empire were stationed. Somewhere beyond Gorvigh Ridge. 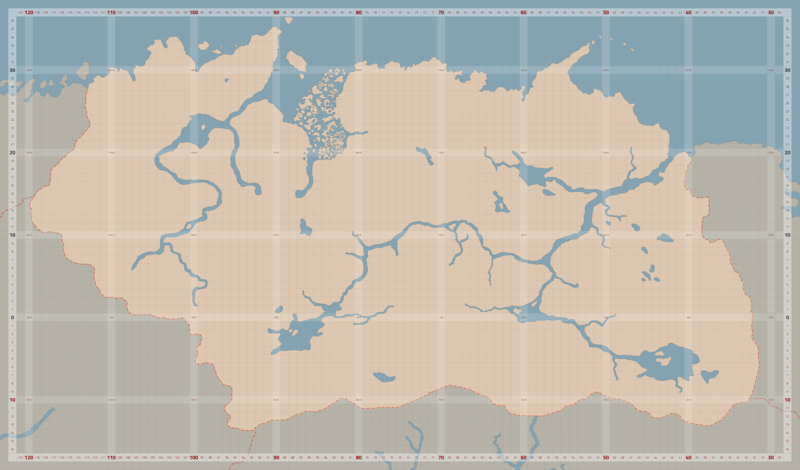 Procrastinated a bit from school work and revised the map once again. Added in the new info worsas posted. I placed the Nerone isthmus west of Dawnstar, and Gorvigh Ridge across from it. I added Porhnak as a settlement on the road towards Dawnstar. Also changed some roads, cliffs etc. In general a lot of changes. The xcf (layered, with cell exports, and the then latest concept map pasted in in layers) is available here. 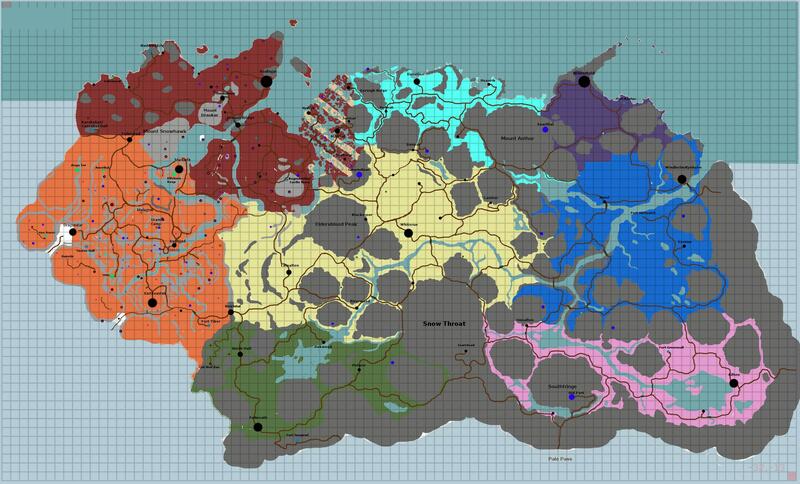 If you want to use it, I can keep adding things to it, snip bigger things from the Gridmap of all Tamriel, whatever you prefer. Hope you'll find it of use. Thankyou for this nice map. Really helpful for orientation. Doesn't PGE say that Red Mountain is taller that the Throat of the World? In Skyrim, I believe they explain that the Throat of the World became the tallest mountain in Tamriel after the explosion of Red Mountain. However, in the context of Morrowind, Red Mountain is still taller. Welcome! Yes, that's quite exactly what it says. But in MW gameworld-terms, Red Mountain ingame is really quite small. (For reference the heightlimit is three times higher than RM is), so as per the discussion in this thread, why impose an arbitrary limit, as you'll rarely see Red Mountain from Skyrim lands anyway. Yeah apparently I missed the second page of this thread. Someone above suggested the red mountain being the taller of the two is a myth. I rather like this idea. Perhaps this could be explained through an in-game npc, near the base of the mountain. We should not mess with Snow Throat VS Red Mountain - lore at all. The only reason we are exceeding its height is simply that there is otherwise not enough vertical range for us. People can still install the bigger red mountain mod to have this problem addressed.